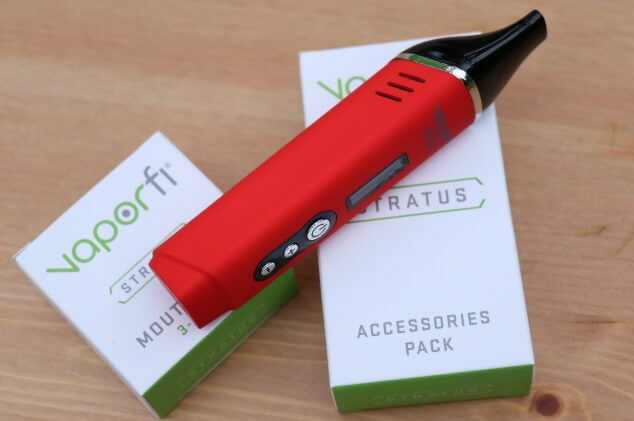 VaporFi Stratus is one of the very first vaporizers that allows the user to increment or decrement the temperature by 1 degree – customization level hard to find in other vaporizers at such a low price. It’s a pen shaped vaporizer that has a sleek design and light weight. Simply put, it can easily fit your pocket, purse, or in your fingers. The product comes with a 30-day money back guarantee – A confirmation that VaporFi stands behind their product. 3 silicone mouthpieces – very nice accessory in terms of hygiene scenario. The temperature can be raised or decreases by one degree. Heating chamber does not burn the herbs. The mouthpiece tends to get hot if it is used for extended period of time but the silicone extensions come in handy. The silver ring between the mouthpiece and the heating chamber can break if dropped or not handled with care. The plastic mouthpiece isn’t my cup of tea as I prefer the glass mouthpiece so I can see the vapor flowing through it. VaporFi Stratus is available in 2 distinct colors black and red. The pen-shaped sleek device is lovely to carry on a festive gathering. Stratus vaporizing technology is of superior technology as compared to even some more pricey vape pens and mighty box mods. The battery life is one of the best as it can be used without charging for more than 24 hours. VaporFi Stratus has an optimal temperature control from 350 degrees F to 430 F, with increments/decrements by 1 degree (like in the best temperature control mods). Therefore, you have the option to utilize 80 different potential temperature settings. This is the most interesting feature I found in this product. VaporFi Stratus is a portable and rechargeable device that is powered with high capacity compact 2200 mAh battery. Remember, it’s not a multipurpose device and can only be used for dry herbs. VaporFi Stratus is a user-friendly device. This is best for beginners and ex-smokers. After four or five uses, the heating compartment needs to be cleaned. The compartment is difficult to clean however it can be filled and refilled rather easily. The heating technology is so good that with a small amount of herb you can easily enjoy vaping for hours. The beautiful LED light will tell you the current temperature of the device and two buttons underneath the power button can be used to adjust the temperature and other settings. 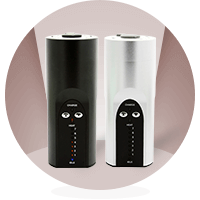 The vaporizing device can be charged using a portable USB mini port charger. You can simply connect it to your mobile charger or even your laptop. The device only takes few hours to charge but lasts for extended vaping sessions. The content wastage is very little, if any. Almost all of the herb content in the chamber is utilized; the residue is very little. This feature makes VaporFi Stratus unique and efficient. On top of that, there’s not burnt taste or bad aftertaste, which means you get a crisp taste and a lot of vapor. 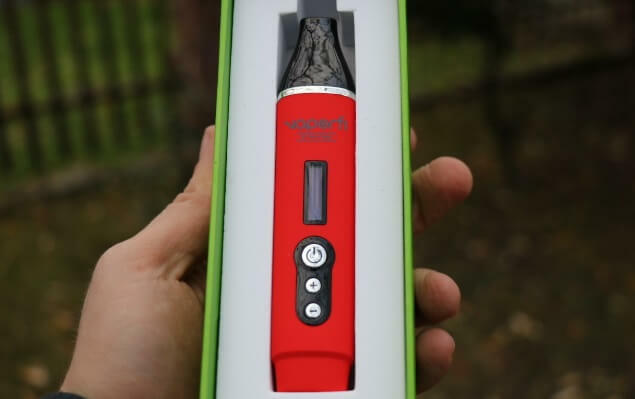 The device is equipped with 3 ventilation chambers that allow the heat to escape so that the device does not heat up more than required by the vaper. I loved the smooth and rich taste of the content in the chamber. Although the mouthpiece gets hot; an extension has to be used to improve the experience which increases the overall size, and is definitely a bummer. The additional mouthpieces are really useful especially if you like to vape with friends. The stratus comes in with a 2200mAh battery that is rechargeable. It weighs only 2.6oz. the battery runs for a complete day; facilitating even those who are in a habit of vaping most of the day. It has a micro USB port charging cable same as that of your mobile. Just unplug your mobile and plug-in your vaporizer. It does not take more than 3 hours to fully charge. The heavy users can easily use it for a complete day without running out of battery. The temperature range available is from 350°F to as hot as 430°F. The heating chamber can hold up to 1 gram of herbs. Another unique feature is that the temperature can be raised by 1°F at a time thus allowing you to customize the heat according to your own choice. Well, as a complete package our entire team loved the experience it offered and give it both thumbs up. The most interesting feature is the level of customization VaporFi Stratus offers in terms of temperature adjustment. The best experience I personally enjoyed was at the temperature of 350F. The mouthpiece gets relatively hot but if a silicone extension is used the experience can be improved. The device is easy to use and refill. Despite missing the pass-through feature – that allows you to vape even when the device is charging, I highly recommend it if you want to get flavorful vapor at an affordable price.